One man’s eclectic view of the ‘70s and the suburbs. While doing research on the Arlington Heights subdivision, Greenbrier, for Last Hand, I came across a number of Ads for neighboring subdivisions. Once such Ad was for Hasbrook, which is the subdivision just south of Greenbrier across Palatine Road. Click on the image for a closer view. It's been a long time since the kids of Greenbrier decorated their bikes for the Fourth of July bike parade that ran through the neighborhood. In the book, Last Hand: A Suburban Memoir of Cards and the Cold War Era, I describe my family’s involvement in the 1973 bike parade. While looking for some references of the bike parade, I came across this footage of the 1964 Greenbrier Fourth of July bike parade which was filmed before the subdivision’s completion. I hope you enjoy it. 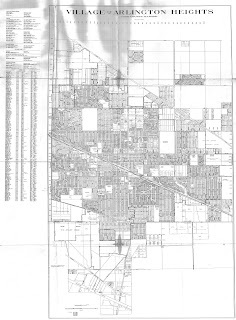 While writing the book, Last Hand a Suburban Memoir of Cards and the Cold War Era, I discovered an old 1961 zoning map my dad had obtained (probably around the time he put his down payment on the house in Greenbrier in October 1961). What is interesting about the map is that it captures a moment in time when Arlington Heights was expanding. Greenbrier, which is at the very top of the map, is the first area north of Palatine road that Arlington Heights annexed. This was also a time when Route 53 was still in the planning stage. Click on the image for a full view. 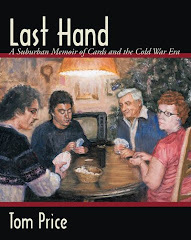 I intend for this blog to be an extension of my book, Last Hand: A Suburban Memoir of Cards and the Cold War Era, capturing some of the changes and elements of American life during the Cold War suburbia.